Disadvantaged Queenslanders who haven’t enjoyed a roast lunch in years are raving about the quality of FareShare meals cooked in our new Brisbane kitchen. “Wow”, “amazing”, “fantastic” was just some of the feedback from last Saturday’s free lunch served by Brisbane charity Dig In. The Spare Ribs I had last week were amazing. The sauce on top was so good and one of the best meals I have ever had. This week is no different. The roast pork was fantastic. I haven’t had a roast in years and I really enjoyed the salty crackling and the vegetables were great. (Ross). Dig In, our Brisbane kitchen’s first community partner, serves FareShare meals in the city’s Fortitude Valley where many rough sleepers and people in temporary accommodation are doing it tough. Curtis Sciacca, one of Dig In’s three founders, said thanks to FareShare, Dig In now aims to put on a second community lunch each week to feed up to 100 people. Curtis (right) from Dig In collects FareShare chef James’ roast pork. 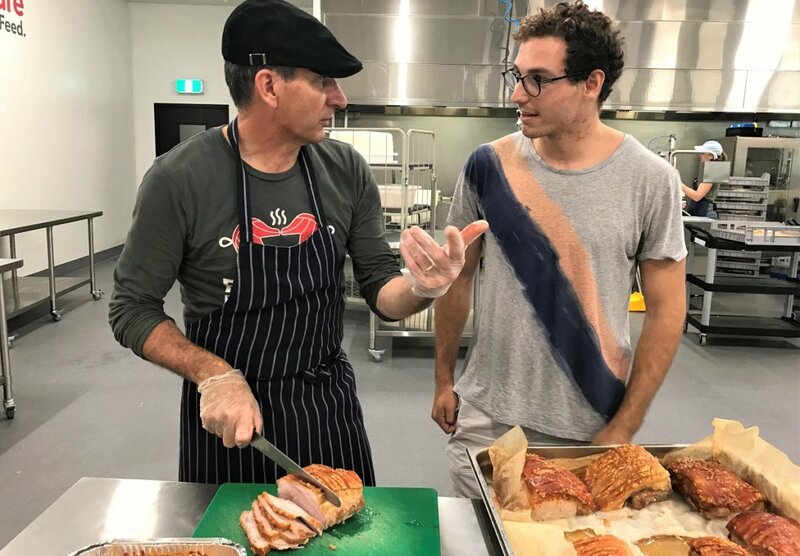 FareShare Brisbane chef James Fien whose roast pork with sweet potatoes, green beans and button squash went down a treat last weekend, lent a hand at a recent community meal.